Join us for a parade from the town centre, through the Creative Quarter, switching on our Christmas lights as we wander through the town. Pick up a lantern or bring your own. Choirs will provide the soundtrack to our journey. The parade will conclude at Quarterhouse with mulled wine, soft drinks, mince pies and a free for all open mic event, part of this year’s Book Festival. All Creative Quarter shops, studios and galleries will stay open until 7pm, with many taking part in a yuletide Christmas Windows Display Competition. Vote for your favourite window display and win amazing prizes! For the opportunity to get some amazing and unique gifts this Christmas check out our talented artists who will also be opening their doors on Saturday 7 and Saturday 21 December, 11am – 6pm. 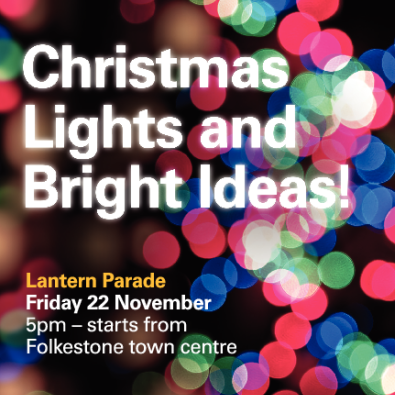 In partnership with Folkestone Town Centre Management.